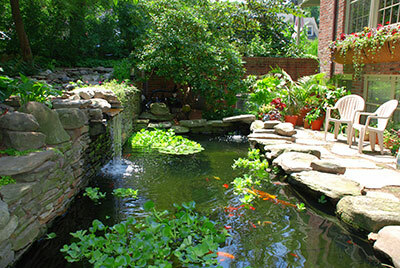 Water features are usually found in garden designs and landscape architecture. They provide a decorative accessory to your already beautiful landscape. Some of these are powered by electricity but because of modern technology and environment considerations, some water features may now use solar power. Are you thinking of adding water features to your landscape? Before you do, check out among the list of water features below to determine what best suit your requirements. Fountains - One of the most common water features, fountains date back the ancient times. Fountains are added as water feature to majority of landscaping designs today. Commercially built fountains in parks and amusement centers are made as musical or simply designed with lights to make them more attractive. In landscapes at home, fountains add peacefulness and tranquility to your garden. Fountains today may likewise be used indoors. Depending on how you would want your fountain to be, Rainbow Acres Landscaping can assist you with various designs that would suit your needs. Ponds - Ponds are also a regular to majority of landscaping designs in the state of Vermont. Others add fish to their ponds to create that extra entertainment for visitors to see. Pond also serves as a habitat for various plants. Waterfalls - Waterfalls are also a favorite of majority of homeowners. It can be combined with ponds for a more unique ambiance. Don’t worry if you don’t have a high ground for this water feature because our team of experts knows how to create a perfectly designed waterfall. Pools - If you're backyard or landscape area is big enough, then add a pool as another water feature. Creating a pool adds functionality in your landscape. We can even create a small waterfall that goes directly to the pool to create that tranquility and relaxing atmosphere. If you want to incorporate this design to your landscape, let us know. This particular water feature design provides an extra living area for entertaining visitors and a place to relax with the family. Streams - If you have a ditch at the back of your home, our landscape designers can transform that into a beautifully designed stream-like water feature. However, you must definitely ensure that a big part of the stream is within your area. Otherwise, your landscaping cost would be put into waste. But we can also create artificial streams with the use of modern technology and construction methods. Our expert landscape designers will explain to you how this particular water feature can be added into your landscape. Regardless of the type of water feature you would want in your landscape, hiring the right and reliable contractor is the key to achieving your ultimate goal. If you are in the areas of Vermont, living in Addison County or perhaps in nearby towns and cities like Vergennes, Bristol, Middlebury, Brandon, Burlington, South Burlington, Essex Junction, Jericho, Montpelier, Northfield, Rutland, Barre, and Waterbury - you can call Rainbow Acres Landscaping. We are experts in the field of landscaping including design and installation of water features. Our friendly office personnel are available to assist you with whatever query you may have. In fact, we offer free estimates for any water feature that you would want to be installed in your landscape. Quality and excellent customer service is our number one goal. And you can be assured not only of expertise in the field but affordability as well.